This is the first compressor from BOSS: it has 3 controls, two knobs for level and sustain and a normal/treble switch, which is somewhat unusual from this manifacturer. I think that the only other Boss compact pedal which has a switch like this is the TW1 (T-Wah or Touch Wah). This unit has been sold from 1978 to 1982, later Boss has made the CS-2 and CS-3. There’s a considerable difference in sound between the CS-1 and its siblings from the same company: this is due to the use of a photocoupler, which has been replaced by a more conventional VCA circuitry in later models. 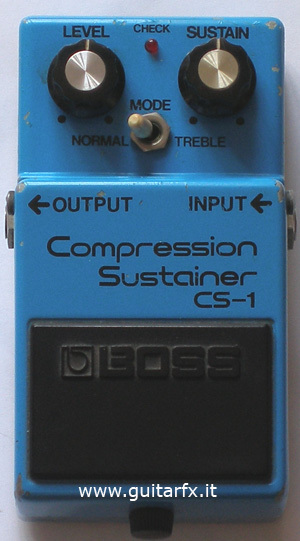 The CS-1 is supposed to have a tighter compression than CS-2 and 3. The pedal in the photo has some wear but still works like a champ. Schematics from Kurt Godiksen great site.